Water is one of the most important substances on planet Earth. All forms of life need water to live. Water is constantly moving about the Earth through the water cycle. Like all "stuff", water is made up of molecules. Maybe you have heard water called H2O? This is actually the chemical formula for the molecule that makes up water. The H stands for hydrogen atoms and the O for oxygen atoms. Each water molecule is made up of two hydrogen atoms and one oxygen atom. Ice - Ice is the solid form of water. When water gets below 0 degrees C (32 deg F) it will freeze and become ice. Liquid - This is the wet stuff we drink and swim around in. Vapor - When water evaporates or gets above 100 degrees C and starts boiling, water turns into its gas state called vapor. Water is literally all over the Earth. Around 70% of the Earth's surface is covered in water. Around 97% of the Earth's water is in the oceans. This water is salt water and we can't drink it. Another 2.4% of the Earth's water is frozen water in glaciers and the polar ice caps. This leaves around 0.6% of the water as freshwater in rivers and lakes that we can drink. Pure water actually has no taste at all. What you taste when you drink tap water or bottled water is minerals and other substances that have dissolved in the water. Yes, water is in a lot of places in outer space. This is because the two elements in water, Hydrogen and Oxygen are two of the most abundant elements in the universe. Much of the water we know about on other planets is ice. Water ice can be found on the Moon, Mars, in Saturn's rings, Pluto, and on Comets. Water vapor is also found in the atmospheres of other planets like Mercury, Venus, Mars, and Jupiter. We use water for more things than just drinking. We use it in agriculture to grow food, in cleaning to wash our clothes and dishes, in firefighting to put out fires, and in hydropower to create energy with dams. These are just a few ways we use water in our lives. Water is often used as the standard in scientific measurements such as temperature and volume. Water that is good for drinking is called potable water. Seventy percent of a human's body is made up of water. 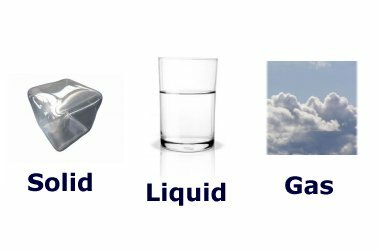 Water dissolves more types of materials than any other liquid. In the United States, the average person will use around 80 gallons of water a day. We use the most water by flushing toilets. Ice is less dense than water allowing giant icebergs to float on top of the ocean.